Soundbar/Centre Speaker Wall Mount. Allows speaker to be positioned for optimum esoteric performance. Wall Brackets. wall plate 40mm wide x 100mm high. Pair of arms. Product Details. Arms 40mm wide x 180mm-290mm deep. 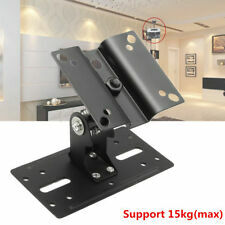 2x Speaker Wall Mount Bracket up to 3,5 KG. Universal speaker wall mount for speakers up to 3,5 kg. Maximum load: 3,5 kg each bracket. Custom label:23526. The speaker bracket's tilt angle can be quickly and easily adjusted to ensure an optimal viewing experience. Universal speaker bracket for easy wall and ceiling mounting. 1x speaker mounting bracket. An original KEF part designed to hold an HTS7001 in a horizontal orientation allowing it to operate as a center dialogue speaker near the TV screen. 1 x Kef centre speaker stand for HTS7001 speaker. The Flexson Desk Stand for the SONOS PLAY:1 speaker is a compact, clever design that angles sound to your ear, minimises vibration and adds a stylish flair. 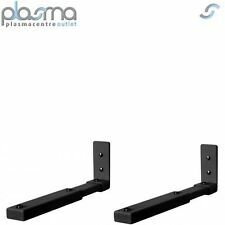 2 x FLEXSON DESK STAND FOR SONOS PLAY:1 - (PAIR) in Black. The Flexson Desk Stand for the SONOS PLAY:1 speaker is a compact, clever design that angles sound to your ear, minimises vibration and adds a stylish flair. 2 x FLEXSON DESK STAND FOR SONOS PLAY:1 - (PAIR) in WHITE. Compatible with all VESA sizes. This is a universal sound bar mount designed to easily attach most sound bars to your wall mounted flat screen TV. Mount your sound bar easily WITH or WITHOUT a TV wall mount. Provides unobtrusive wall-mounting for redesigned for Bose cube speakers. - Crude scrub and glaze light surface,touch smooth. 1 x Wall Bracket Set And Accessories. Rectangular bracket:8.4 x 4.1 x 1.85cm. Hang your for Echo Spot smart speaker on the wall to save more space of your room, as after installation, it is almost invisible. This wall mount is specially designed for Echo Spot speaker, let music get rid of the limitation of place and make your living room or bathroom full of wonderful music. Made for SONOS: specially designed for SONOS PLAY 1 and SONOS PLAY 3 speakers; sold as single piece or in pairs. Mount your SONOS PLAY:1 or PLAY:3 speaker with this subtle yet handy speaker wall bracket. Standard UB-20 Black Series 2 Wall Mount Bracket for Bose Cube Speakers. All Bose speakers with 4 slots on rear. Centre speakers series 2 all. Jewel centres series 2 all. Double cubes series 2 all. 5x dowels and screws (needed to mount the wall bracket). The brackets are small and very stable. 5x dowels and screws (needed to mount the wall bracket). Speaker bracket speaker wall mount box Logitech Z103 Z906 Z55 PIONEER HTP-071. Wall bracket for loudspeakers, up to 4kg load capacity per bracket. 5 x Natural Boar Hair Detail Brush Set Automotive Detailing For Car Cleaning. Electric PracticaL Mosquito Killer Zapper USB LED Light Lamp Fly Insect Bug Trap. Electric UV Insect Killer Mosquito Pest Fly Bug Zapper Catcher Trap UK LED Light. The TM-SONO 1 is a wall bracket for the SONOS® Play:1 speaker. Compatible with SONOS® Play:1. Tilt: 0° to -18°. The speaker can also be ceiling mounted. 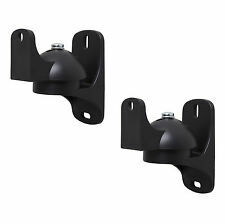 PART CODE: Flexson Desk Stand Mount for Sonos PLAY:1 ( FLXP1DS2021 ) Pair Black. 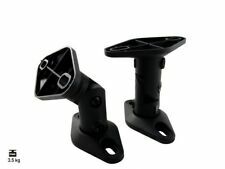 1 X PAIR OF FLEXSON DESK STAND MOUNTS FOR PLAY:1. Flexson Desk Stand for SONOS PLAY:1 – key features. The Flexson Desk Stand for the SONOS PLAY:1 speaker is a compact, clever design that angles sound to your ear, minimises vibration and adds a stylish flair. Large capacity:Supports speakers up to 35 kg on wood stud, concrete or brick wall. 1 x Speaker Bracket. Durable steel construction. Size:As the picture shows. The TM-SONO 5 is a wall bracket for the SONOS® Play:5 speaker Gen 2™. Compatible with SONOS® Play:5 Gen 2™. Tilt: 0° to -15°. 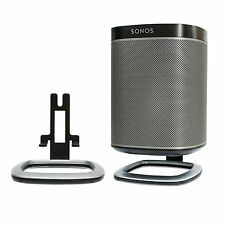 SONOS PLAY 1 3 SPEAKER WALL BRACKET. IDEAL FOR YOUR SONOS PLAY:1 & 3 SPEAKERS. ALL FIXINGS INCLUDED. MULTI POSITIONING, TILT, SWIVEL & ROTATE FUNCTIONS. Power Protection & Distribute. The storage organize is made of ABS, and it is safe and non-toxic. You can install the speaker on the wall, easy to use. Easy installation: easy to install the speaker organize, easy to use.